We are springifying the 2006 T-2675 that we purchased last fall. While attempting to fill the fresh water tank, I'm seeing water inside the maintenance area just inside the fresh water fill. It's all along the seam where the floor meets the outside wall. I'm a newbie TT owner so this is my first time dealing with tanks. I am using a fresh water fill wand and noticed that water (not all the water) comes back out the fill hole after about 5-10 seconds. I've tried cutting back the pressure to no avail. Looking for advice on possible root cause and next steps. Help! I may be able to help. We just had 2 of those fill spouts out this winter. Is this the area you are seeing water? While attempting to fill the fresh water tank, I'm seeing water inside the maintenance area just inside the fresh water fill. It's all along the seam where the floor meets the outside wall. Just below the white and green hose. And assuming it is clearwater from you just trying to fill the tank. Your pics did not seem to show water, but that does not mean it is not there, just I did not notice it in the pic. Was it there and I missed it? It is possible there is a pinhole leak in the green and white striped hose where the hose clamps onto the fill spout. I have seen pin holes there before as they heated the hose so much to shrink it down that it tore a small part of the hose open. There is a worm drive stainless clamp there too which "might" be loose. The clear hose next to the white striped green hose is the fresh tank vent hose. There is a PEX crimp clamp on that hose to a male spout on the fill compartment area. Hoping that hose did not slip back some. While the vent hose is not a normal leak area, you may have a vent tube problem and it might be leaking at that crimp fitting. I am using a fresh water fill wand and noticed that water (not all the water) comes back out the fill hole after about 5-10 seconds. I've tried cutting back the pressure to no avail. What does the "Water fill wand" you are using look like? Take pic and post or a link to where you bought it. The fill hose should be and can be put inside the white fill spout so you do not have to hold it. But it is "not" to be a pressure tight seal. This gravity fill is just like a gas hose stuck in your car tank when getting gas. The vent tube next to the water fill spout on your vintage camper should have a small brass screen over it to keep large things out. There is a white silicone ring pressed in to hold the screen in place. That screen needs to be clean enough to not be plugged to let air out of the tank. 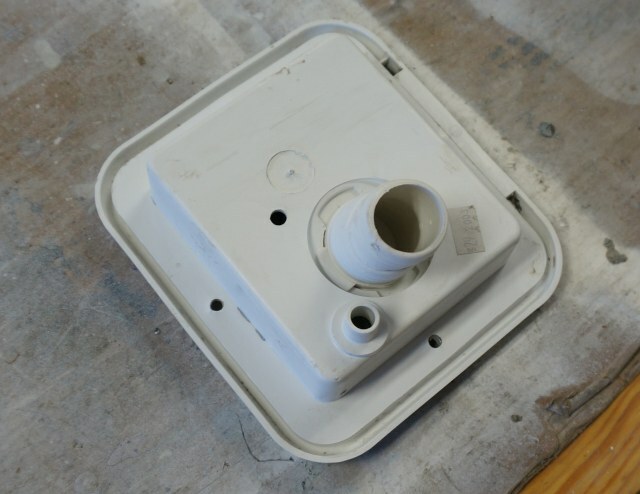 If the vent is plugged then water can spit back at you when you are trying to fill the tank as it has to vent out the fill pipe as it cannot get out the vent tube. You can use a small screwdriver or pick and the white ring will come out and then the screen. To your leak inside, we need to confirm we know where the leak is coming in from first. Try putting some dry paper towels in the area after you mop it all up. Then add some more water to try and pinpoint where it is coming in from the wet on the towels. May need a helper, one looking one pouring water in. Once you know, we can help tell you how to fix that. I did not want to tell how how to fix the wrong problems. Thanks for all the great suggestions JohnB! We're going to work on it tonight. I'll be back online to provide updates. I wiped up the water before taking the pics. Silly me lol. Yes it is clear water. I dried it up, tried again with a paper towel under the blue/red pipes, then tried again. Came back to soaked paper towels. Good news...the utility area is getting cleaner from all the water/wiping. We just did the experiment to see where the water is coming in. It is coming in from the hole in the wall where the hoses go in/out. It happens at the moment the person on the outside sees water flowing back out of the fill hose. I just crawled under to look at the hoses and connections. It appears the vent tube is the likely culprit. It looks pretty nasty - grey/green/black. How do we clean it? Is the only option to take it off at the tank and clean the inside? Clean with what? P.S. I guess I'm paranoid about water in my rig...I dried it up before taking the pic. Again. The vent tube shouldn't get water in it until the fresh water tank is almost full. Your fill hose (green and white one) doesn't look in too good shape from the first pic. It looks cracked, but that might just be the picture. Sorry. I am incorrect on the vent tube. My setup is the same way. Don't know why I thought the vent line was at the top of the tank. Another thing to look at is make sure the fill hose doesn't pitch upward before it goes down to water tank. Those hose clamps are notorious for not sealing ribbed hoses properly. The fill hose pitches upwards within the first two feet inside the trailer before going down. 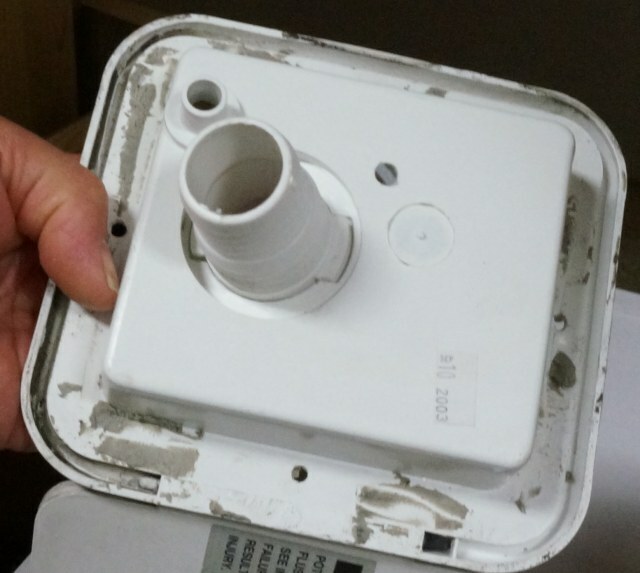 It looks like this is the way it was installed. I think that is why the water runs out while filling. In my opinion, this is a very probable source of the leak as well. You could possibly push/pull the fill hose down more through the floor and reseal the space to get a downward flow. Be careful not to crack the bottom end. Once you get a downward angle, water won't back up at the fill entrance and leak through the PIA hose clamp. Another option is to tie the fill hose to one of the lines on the floor just to get that downward angle. Might be less work than having to reseal the floor hole. I want to confirm I am understanding "where" you see the water coming in. Tell me if I have this correct. You have narrowed down the problem that when water spits back out at you when filling, "only" then at the instant it starts spitting, water will then show up inside. Is that correct? 1. A hole in the green and white striped hose that once the water backs up it can find that hole and leak inside. The fill wand normally sticks in deep enough that hole never sees water until water back up the tube. 2. Water back flowing out the fill tube is wicking around the fill spout and and sneaking in around the fill spout into the camper. I am going to show you some pics of the gravity water fill door out in the open to help explain some. 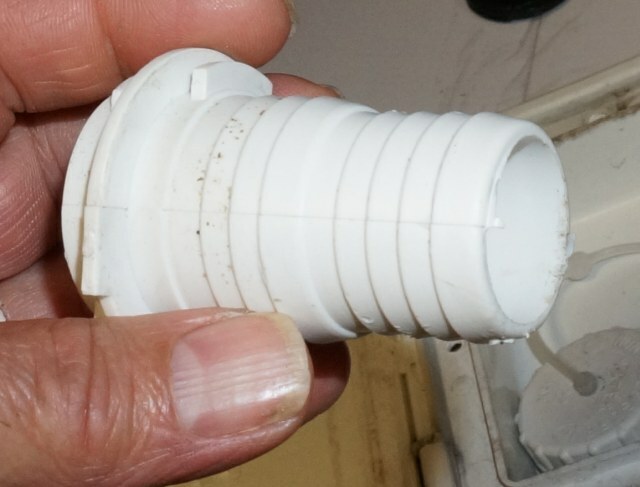 Here is the fill cap off exposing the fill spout. 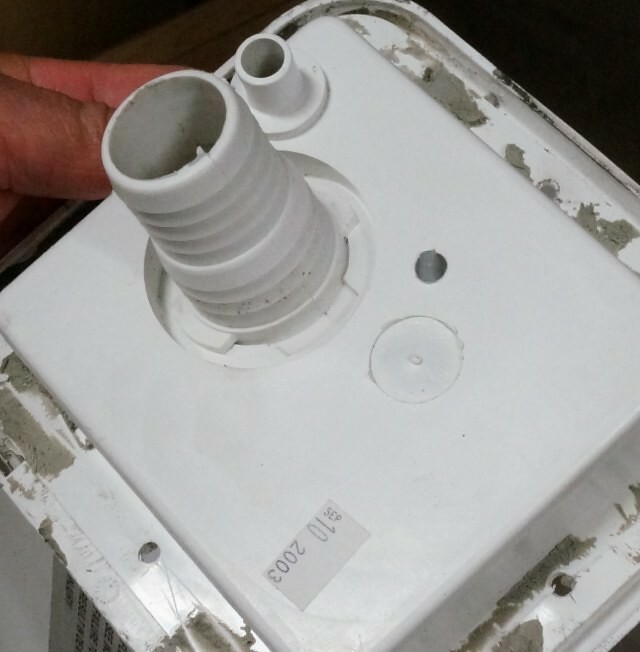 The fill spout can be twisted and then locked into the gravity water fill door unit. If the spout is not twisted into the correct place to lock it in, then there is a gap between the spout and the door unit. This normally is not a problem but it can be and we need to rule it out. You should be able to see on the inside what I am going to show you. Your pic angle does not show the area well enough to tell. Here back side of the unit. 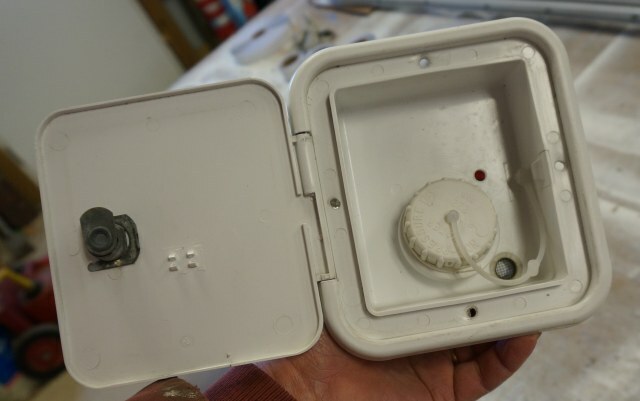 You can see in the last pic, the water spout has 2 tabs on it that when installing it have to be oriented with the 2 slots in the door unit. 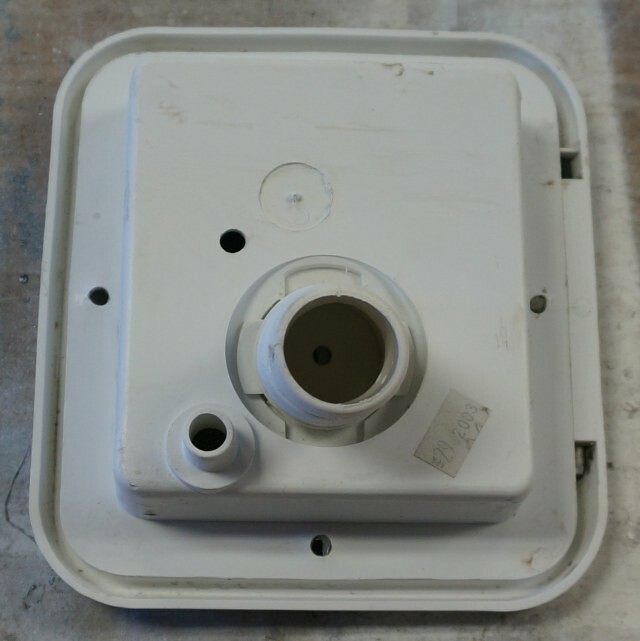 Then the spout can be put in and twisted 90 degrees to lock it in place and create a basic compression seal to the door out. Here is the spout removed. You can see the hose barbs on the outside and tabs that need to align with the tab slots in the door. The spout oriented in the door, but not yet locked in place. 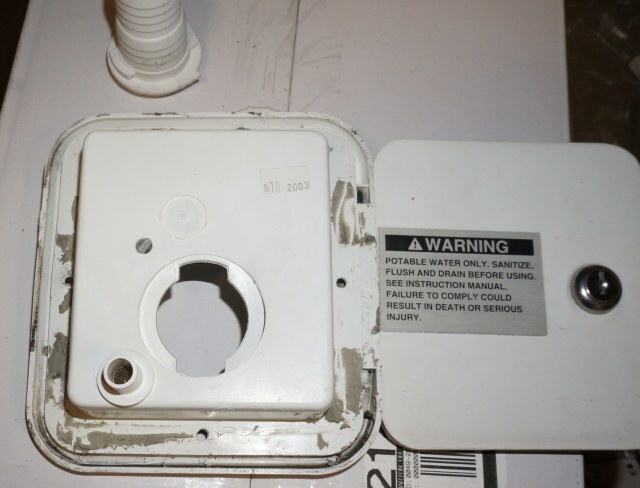 Look and see on yours, are the spout locking tabs rotated to hold the spout tight to the door unit, OR are then in line with the clearance tabs in the door unit and the fill spout loose and wiggly? The spout does not have to be a full 90 degree rotated to create a good seal. It can be approx 20 to 30 degrees and still create some kind of seal. If the spout is tight, then odds are high the leak is coming in a hole in the hose OR the worm clamp needs to be tightened. If the leak is coming in the hose hole or loose clamp, you "might" be able to see it drip from the bottom of the hose. With a flashlight and maybe a small mirror you may be able to look inside the green hose from outside and see a hole in the hose. OR just pour a small amount of water in the spout at the very end and see if it runs in side with towels under it. You are trying to confirm how the water is getting around that spout. Take a look and report back. Now to the vent hose and the green hose underneath. Yes that looks ugly, some do when they are exposed under the camper. But it may be outside dirt, both on the green hose and the vent tube. Take some cleaner (soap and water, most any kind of spray kitchen counter cleaner etc) on a rag/paper towel and clean that outside of both. Then you can tell if the green hose has some cracks in it like Jim mentioned and you can see if the vent tube is clogged inside the tube once you get the dirt off the outside. One heads up, I am cautious about having you remove either of those 2 hoses. It may come to that in the end but they can be notorious for leaking once disturbed. And then we need to get into food grade silicone like Sunline used to create a seal. Point being, don't just tear into taking the green and white striped hose off until you know for sure it has to come off. That fill wand is a good one. No issues there. It appears the vent tube is the likely culprit. It looks pretty nasty - grey/green/black. How do we clean it? Is the only option to take it off at the tank and clean the inside? Clean with what? I mentioned about how to clean the "outside". If the inside is dirty that gets a little more involved and some of it "depends" on how bad the dirt/clog/green yuk "inside" the hose is. Both hoses can be sanitized/cleaned during the chlorine shock treatment process and should be regardless. When the tank is totally filled with water/chlorine solution, water should back up both hoses all the way until it just starts flowing out. That will clean the inside of both hoses. It will take time though to have it eat out the gunk if there is any. And you have it make sure the chlorine solution is actually up that high in the hose and not just plain water. The chlorine at that tank schock treating strength will oxidize the green yuk out. You make need to pour a mixed up solution down the both hoses once the tank is almost all the way full to make sure the solution is at concentration in the hoses all the way to the top. 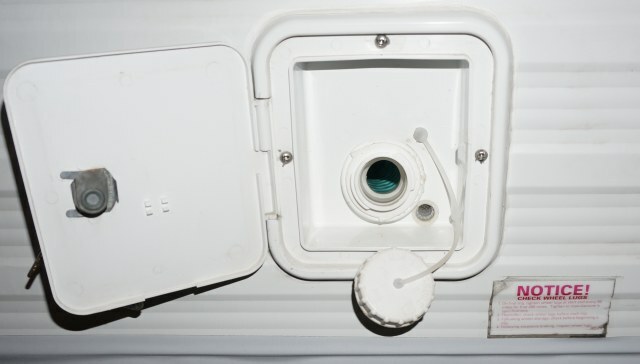 In your case, we really need to get the leak into the camper fixed first before you do the shock treatment as it will end up all in the camper too however that leak is occurring. If you cannot chlorine shock treat the yuk out of there, and it may take a few times, then you may have to replace the hose. And hopefully the tank is not full of it too. Some members had to remove the tank and hose blast water into to get it to flush out while turning the tank over. This is the extreme case but they inherited the problem from the prior owner who never cleaned the fresh tank each year. Once clean and kept clean this is not a real big deal to keep them that way but it has to be kept after annually. 22 years camping and I never realized that fill spout twists out of the door housing. That would have saved me a lot of time and aggravation reaching through that access panel removing and re-attaching the clamp on the fill hose when I replaced the cracked hose. If you decide to replace your fill hose, this is what I used. It has a fairly smooth inside bore for better sealing with a hose clamp. First things first....the Sunline Owners Group is the bomb! We're thrilled that we bought a Sunline and found this group. We love our Sunline! We determined that the issue was that the water fill hose takes an upward pitch just after entering the RV. I held it down while hubby Preston filled it. Voila! Success! No more leak. We'll wire tie it down but at least we now have a solution.